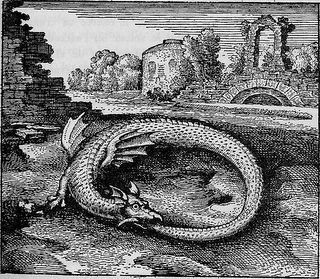 Jung stated "The alchemists, who in their own way knew more about the nature of the individuation process than we moderns do, expressed this paradox through the symbol of the Ouroboros, the snake that eats its own tail. The Ouroboros has been said to have a meaning of infinity or wholeness. In the age-old image of the Ouroboros lies the thought of devouring oneself and turning oneself into a circulatory process, for it was clear to the more astute alchemists that the prima materia of the art was man himself. The Ouroboros is a dramatic symbol for the integration and assimilation of the opposite, i.e. of the shadow. This 'feed-back' process is at the same time a symbol of immortality, since it is said of the Ouroboros that he slays himself and brings himself to life, fertilizes himself and gives birth to himself. He symbolizes the One, who proceeds from the clash of opposites, and he therefore constitutes the secret of the prima materia which [...] unquestionably stems from man's unconscious."